The General Settings section controls some of the most basic configuration settings for your site: your site's title and location, who may register an account at your site, and how dates and times are calculated and displayed.In order to access the general settings go to Settings → General. The Settings → General screen. Enter the name of your site (or blog) here. Most themes will display this title, at the top of every page, and in the reader's browser titlebar. WordPress also uses this title as the identifying name for your syndication feeds (RSS). In a few words, explain what your site is about. Your sites's slogan, or tagline, might be entered here. A tagline is short phrase, or sentence, used to convey the essence of the site and is often funny or eye-catching. Enter the full URL of the directory containing your WordPress core application files (e.g., wp-config.php, wp-admin, wp-content, and wp-includes). For example, if you installed WordPress into a directory called blog, then the WordPress address would be http://example.net/blog (where example.net is your domain). If you installed WordPress into your web root, this address will be the root URL http://example.net. WordPress will trim a slash (/) from the end. Enter the address you want people to type in their browser to reach your WordPress site. This is the directory where WordPress's main index.php file is installed. The Site address (URL) is identical to the WordPress address (URL) (above) unless you are giving WordPress its own directory. WordPress will trim a slash (/) from the end. Enter the e-mail address to which you want WordPress to send messages regarding the administration and maintenance of your WordPress site.For example, if you allow new users to register as a member of your site (see Membership below), then a notification will be sent through e-mail to this address. In addition, if the option, An administrator must always approve the comment, is set in Administration → Settings → Discussion, this e-mail address will receive notification that the comment is being held for moderation.Please note this is different than the address you supplied for the admin user account; the admin account e-mail address is sent an e-mail only when someone submits a comment to a post by admin. The address you enter here will never be displayed on the site. You can send messages to multiple admins by using an email address which forwards email to multiple recipients. Check the Anyone can register checkbox if you want anyone to be able to register an account on your site. This pull-down box allows you to select the default Role that is assigned to new users. This Default Role will be assigned to newly registered members or users added via the administration panel. From the pulldown box, choose a city in the same timezone as you. For example, under America, select New York if you reside in the Eastern Timezone of the United States that honors daylight savings times. If you can't identify a city in your timezone, select one of the Manual Offsets that represents the number of hours by which your time differs from Greenwich Mean Time. Click the Save Changes button and the UTC time and "Local time" will display to confirm the correct Timezone was selected. The format in which to display dates on your site. This setting controls the format the theme displays dates in, but does not control how the date is displayed in the administrative panel. Select one of the proposed formats or see Formatting Date and Time in the WordPress documentation for more available formats. The format in which to display times on your site. This setting controls the format the theme displays times in, but does not control how the time is displayed in the administrative panel. Select one of the proposed formats or see Formatting Date and Time in the WordPress documentation for more available formats. 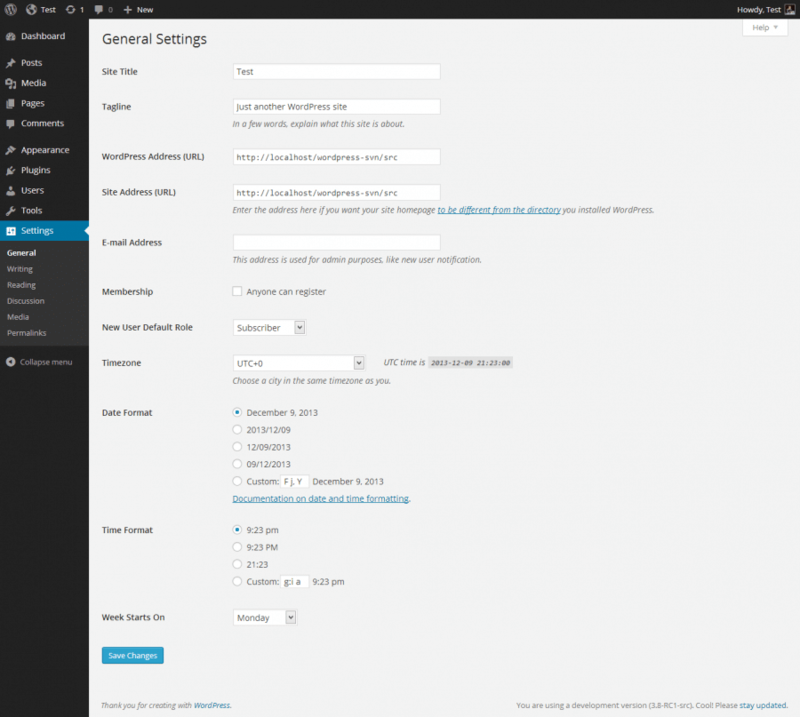 Select your preferred start date for WordPress calendars from the drop-down box. Monday is the default setting for this drop-down, meaning a monthly calendar will show Monday in the first column. If you want your calendar to show Sunday as the first column, then select Sunday from the drop-down. The language for the WordPress administration panel as well as the front-end of the site. Read Configuring Site Language for information on how languages in WordPress work and how to translate the theme into your own language.